- Nero watching gladiator matches through polished emeralds to block the glare of the sun. - Chinese judges as the 12th century C.E. used glasses made of smoky quartz to hide their facial expressions while interrogating witnesses. 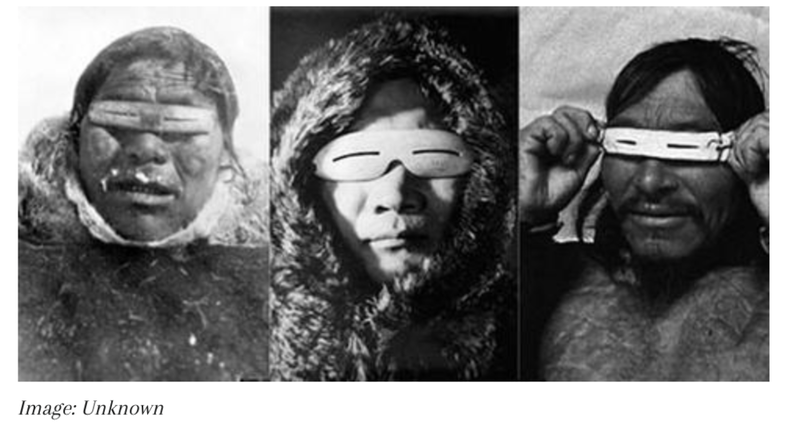 Documented evidence that the Inuit wore glasses with thin slits, all carved out of walrus ivory indicates that dealing with the glare of the sun has been an issue since prehistoric times. It wasn't until the 1750s when an optician named James Ayscough started experimenting with tinted lenses in glasses. Ironically, the exploration was not to fight glare; it was to try and heal vision-related impairments. Then the history gets shady. Sunglasses are developed for health concerns and then the history jumps to 1929 when Sam Foster started selling sunglasses as we know them today on the Atlantic City boardwalk. As happens with many trends, there were two big promoters of sunglasses that helped them catch on. Hollywood movie stars and the military! Celebrities took to them because when they shot scenes outside, they could wear them to avoid the sun's glare. Makes sense. Reflective aviator sunglasses were developed for the military in the 1930s and were later sold to the general public with great aplomb. Since then, sunglasses trend every season with changes in shapes, colors and sizes all the while still serving their original purpose - keeping the sun out of your eyes! Step 1. Explore the kinds of sunglasses that are out there (and categorized by face shape!) Step 2. Decide if you like any of them. Step 3. Design your own glasses! BONUS: Make a case for your brand new shades, too! Because someone has found a super simple way to create fun sunglasses cookies! Nutter Butters + an homage to Top Gun? Yes please!